If you’ve been struck by the crisp, vivid fall colors on display this year, you’re probably not alone. Last year, a slightly warmer-than-usual October (the average temperature was near 60 degrees) resulted in a less-than-impressive autumnal display. “The colors came much later and they weren’t nearly as vivid,” said Tim Johnson, director of horticulture at the Chicago Botanic Garden. October is painting a much different picture this year. With an average temperature of 53 degrees – just below Chicago’s historic average of 54 degrees for October, according to the National Weather Service – leaves on area trees are displaying sharp tones of gold, red and orange, with hints of brown mixed in, Johnson said. In order to display maximum fall color, a tree must be healthy and well watered. But it also needs the right combination of cool nights and sun-filled days, with a limited number of thunderstorms, which often rip off the leaves before they are ready, according to the Botanic Garden’s website. At the Botanic Garden in Glencoe, Johnson said fall colors are at their peak right now, and he anticipates they’ll stick around for another two to three weeks. That could change with a particularly cold night or two, however, as temperatures in the 20s or lower would accelerate the rate at which trees lose their leaves, he said. 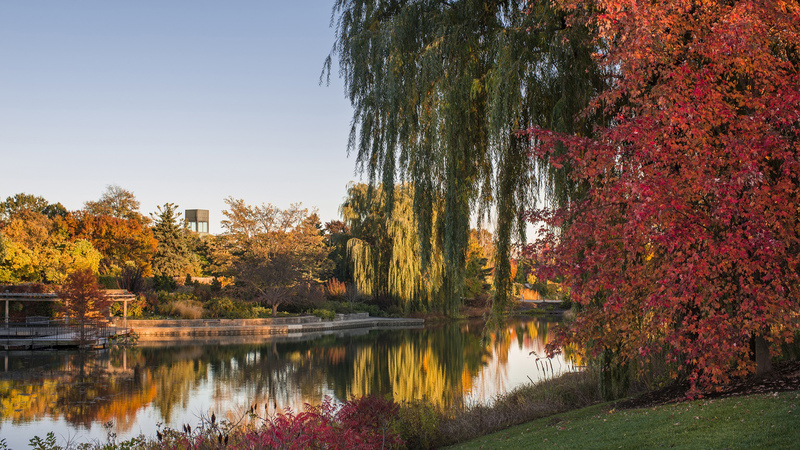 Combining trees in the Botanic Garden’s collections and native trees that surround the Garden, visitors can see about 40,000 trees that show color in the fall. To experience this range of crisp colors, the Garden recommends a fall color tree walk starting at the Visitor Center, continuing along the Garden’s East Road and ending at the Daniel F. and Ada L. Rice Plant Conservation Science Center. Along the way, visitors will see golds, reds and oranges from various tree species, including maples, lindens and ginkgos; gardens filled with fall annual plants and late-flowering perennials; late-season roses still in bloom; native grasses growing tall; and a few unexpected colors, like the unchanging green on evergreen trees and the stark white on the trunks of birch trees. For more information about an ideal tree walk and upcoming events, visit the Botanic Garden’s website.